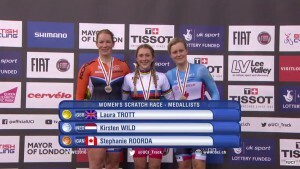 Track Cycling World Championships – Silver medal for Kirsten! First out in the Track Cycling World Championships was Tatiana, Simona (Italy) and Charlotte (Germany) in the Team Time Trial. Both teams did strong performances, but to qualify for the next round the teams had to be top 8. Germany finished 10th and was therefore done, while Italy finished 7th and got to ride for better results next day. On second day Italy managed a new national record at 4’26”162 and advanced on the result list to a 6th.